This chapter introduces Performance Case modeling as a means of conducting a performance analysis. It argues that the design of any instruction focused on practical subjects should be preceded by understanding of the performance requirements for graduates of a course of instruction. This understanding is facilitated by the collaborative creation of diagrams that identify the different roles a performer takes and their associated goals, together with documentation of performance measures for the goals. The measures serve as a baseline for the evaluation of instructional effectiveness. 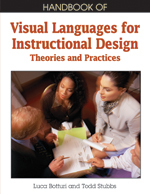 Other approaches to visual languages in instructional design have been more focused on modeling the architecture of the instructional system rather than the performance environment in which its graduates will be expected to perform. The approach described is based on UML Use Cases and serves to focus thinking on the performance analysis that should occur prior to the design of instruction.